These are the stories that The PAX Illuminati doesn’t want you to know. Everything is connected. There are no coincidences. Why isn’t Lando in Star Wars Episode VII? Do you really think Tibanna gas can melt durasteel beams? The Death Star destruction was an inside job. Do you still not believe that Aperture Science is real? How do you think they have a PAX Australia? Now you’re thinking with Portals. Why is it so hard to get a PAX West badge? PAX takes place across infinite realities simultaneously! There exists a reality where even YOU are at a PAX right now. IT COULD EVEN BE THIS REALITY! Half Life 3 was already released, and nobody remembers it! The games chosen for the Omegathon are simulations designed to choose players who will excel in warfare against the Illuminati’s many alien enemies! Welcome to The PAX Files. I’m your host, John Johnson. Now I know what you’re thinking, “how do we know all this to be true?” Well the truth isn’t Out There… it’s RIGHT HERE at PAX West 2015. 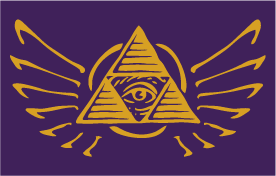 Trilluminati was an attempt to bring the sensibility and levelheadedness of conspiracy theory to PAX. Once on the ground, it very quickly devolved into just handing out tin foil hats to everyone, which turned out to be just as entertaining, if not even more so.